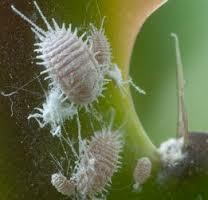 Scale, along with mealybugs and aphids are of the same order - Homoptera. Collectively, there are thousands of scale insects. The cottony cushion scale, Icerya purchasi (pictured above) is just one. Scales can be difficult to control, especially with sprays as most have a natural talent for self-preservation. First of all, most permanently attach themselves to the plant or tree which plays host to them. Secondly, most are equipped with a protective covering, usually composed of waxy secretions forming either a shell of sorts or dense mat of waxy filaments or fuzz. These characteristics contribute to them being very troublesome and difficult to control. Many different plants, shrubs and trees can be affected with scale. Mass plantings really play into the hands (so to speak) of scale as they can quickly spread from one plant to another and therefore affect all the plants in, for instance a hedge. Scale take up residence on stems and leaves - everywhere and anywhere really. If you are serious about controlling them it does take some determined effort - by spraying very heavily, making sure that every scale is well wetted down. There are several commercially available scale controls available. The parasitoids are fairly selective so you must have proper identification. However, if you've identified the little blighters, have chosen the correct bio-control agent and been quite diligent in application and frequency of application, there might be a chance that you have won the war on scale! If anyone has a sure-fire way of waging this war - please share your tips and tricks by adding a comment to the bottom of this post.